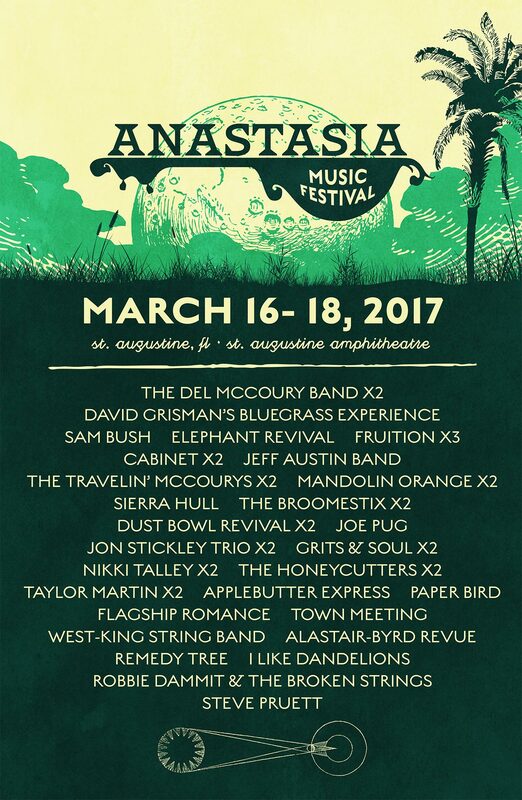 St. Augustine, Fla. — In an epic three-day celebration of traditional and modern bluegrass music, the Anastasia Music Festival will feature over 20 of the brightest bluegrass stars performing live at the St. Augustine Amphitheatre Thursday, March 16 through Saturday, March 18. Set to perform areThe Del McCoury Band, David Grisman’s Bluegrass Experience, Sam Bush, Elephant Revival, Fruition, Cabinet, Jeff Austin Band, The Travelin’ McCourys, Mandolin Orange, Sierra Hull, The Broomestix, Dustbowl Revival, Joe Pug, Jon Stickley Trio, The Honeycutters and more! Anastasia Music Festival is excited to announce late night parties each night! On Thursday, Taylor Martin will host the “Anastasia Park Players” at Hoptinger St Augustine. Firewater Tent Revival Band hosts Friday night, also at Hoptinger St Augustine. Jon Stickley Trio & Friends performSaturday’s late night at Elks Lodge. Expect lots of special guests and late night fun! Music will be on three stages of music at the St. Augustine Amphitheater and runs until 10pm on Thursday and 10:30pm on Friday and Saturday nights with the late night parties starting directly following. It’s also quite special to note that three generations of McCourys are represented at Anastasia. The Broomestix, a nine-piece R&B/Soul/Funk/Pop group out of the Nashville area, features Del McCoury’s grandson, Evan McCoury, on guitar, very exciting! This family-friendly event also features a Kid’s Tent on Friday and Saturday featuring fun activities for children and Brenda Star Walker will host daily yoga on Friday and Saturday. Children 10 and under are free with paid adult admission. Information on camping packages and other accommodations are available online at www.anastasiamusicfestival.com. Performing on Thursday, March 16 will be Fruition, The Broomestix, The Honeycutters, Grits & Soul, Nikki Talley, Taylor Martin, and more to be announced. Gates are at 3pm with music starting at 4pm and music ends on Thursday at 10pm. Friday, March 17 will feature performances by The Del McCoury Band, David Grisman’s Bluegrass Experience, The Travelin’ McCourys, Elephant Revival, Fruition, Cabinet, The Broomestix, Dustbowl Revival, Mandolin Orange, Jon Stickley Trio, The Honeycutters, Joe Pugg, Grits & Soul, Nikki Talley, Taylor Martin, Flagship Romance, I Like Dandelions, and Paper Bird. Gates are at 11am with music starting at 12pm and ending at Friday at10:30pm. Saturday, March 18 performances include sets by Grateful Ball with The Travelin’ McCourys and Jeff Austin, Sam Bush, The Del McCoury Band, Cabinet, Fruition, The Jeff Austin Band, Sierra Hull, Mandolin Orange, Jon Stickley Trio, Dustbowl Revival, Joe Pugg, Taylor Martin, Nikki Talley, Town Meeting, West King Band, Alastair – Byrd Revue, Robbie Dammit & The Broken Strings, and Remedy Tree. Gates are at 11am with music starting at12pm and ending at 10:30pm. More information on all the performers can be found online at www.anastasiamusicfestival.com in addition to camping and hotel accommodations, as well as volunteer and vending information. VIP, Three-day, and Single day tickets for the Anastasia Music Festival are on sale now at the St. Augustine Amphitheatre and Ponte Vedra Concert Hall Box Offices, online at ticketmaster.com, all authorized TicketMaster outlets, or by phone at800-745-3000. For more information and to stay up to date on news, please visit www.anastasiamusicfestival.com, www.facebook.com/AnastasiaMusicFestival,www.twitter.com/AnastasiaFest17, www.instagram.com/anastasiafest17, and www.staugamphitheatre.com. Stage Schedules & After Parties Announced!